Ahmad Rahami was another stooge fake bomber. These staged situations are just getting more and more transparent. Making a bomb with a $29.95 pressure cooker? That's really high tech stuff, right? Get the attention off what is really going on in the world. GET THE ATTENTION OFF SYRIA. Make the sheeple think ISIS is under their beds. On Monday September 19 the government fabricated the NY “terror attack” to also get the attention off Hillary’s terminal health issues. It worked! What’s next? Another 9/11 fraud to “delay” the elections? Very possible. The main reason is to take your attention off the war in Syria. 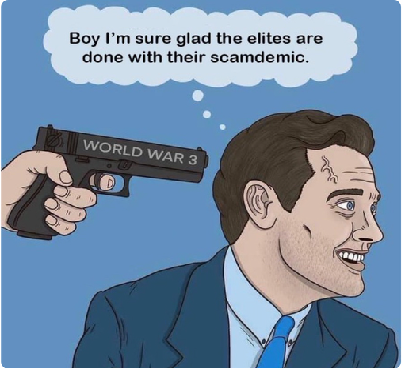 We actually bombed Syrian soldiers, killing 83 of them, and injuring another 100. Russia and China should have simply vaporized us at that point. They have put up with enough of our imperialistic crap, and are going to make us pay for it one day. We are vastly outnumbered and outgunned by them and Iran. Other countries will join them against the U.S., as we are universally hated around the world now. The debates will be held at Hofstra University in NY. Hofstra is a heavily Jewish owned, Jewish run and Jewish attended college with 14 Jewish studies classes. The students are overwhelming extreme leftists, Marxists, neocons, Democrats, and Hillary supporters. They are in the top 20 private colleges with regards to Jewish attendance. This just must be a coincidence, right? SHE WORE AN EARPIECE TO THE DEBATE!!!! See the electronic box on her back? No, it isn't a microphone for God's sakes! The micro-phones were on the podiums. The Democratic officials were forced to deny she would use an inductive earphone to be coached. Her hair covers up her ears however, and no check was done to see if she was using her infamous inductive earpiece. She also had a teleprompter built into her podium. Google that if you want details and proof. Seriously, she had her own personal teleprompter to coach her. The Clintons never obey the rules anyway. Trump does not need coaching, help, or ear pieces. She was continually coached during her entire performance. She can't even talk without help! Holt threw hardballs at Trump and softballs at Hillary. The entire debate was rigged to death! Go to this 2.45 minute youtube link and see for yourself. Her photo is blown up so you can clearly see her earpiece. This is undeniable. Why is she allowed to break all the rules and do whatever she wants? Why spend more time talking about Hillary dying? Anyone with an I.Q. over 10 knows she's almost dead. Because she is running for President with three feet in the grave. Can she make it another 38 days? That is the Big Question. Trump merely takes a cholesterol medication. His appearance on Dr. Oz with his medical records seemed very honest. Many medical specialists agree these are some of the drugs she is probably on..
Reteplase for venous sinus thrombosis. Zoloft or Lexapro for depression. There is an excellent 400 page book The Mandibles by Lionel Shriver. This takes place 13 years from now in 2029. Whites are a minority in America, Latinos keep breeding endlessly, and Spanish is the national currency. Both presidential candidates are always Latinos. A fat Mexican is president and the country has been reduced to a Third World cesspool. Chelsea was the previous president. The dollar is worthless. The rest of the world is using the “Bancor” international currency. The U.S. has reneged on all it’s debt, and T-Bond, T-Bills, etc. are now worthless. This is called the "Renunciation". The tax rate for everyone is 77%, even if you sell something to your friend. The middle class and the rich are decimated. The poor are now homeless. The entire standard of living has been reduced to a Third World country. The police only answer serious felony calls, if at all. The FBI has been reduced to a website. The CIA doesn't exist. Grocery stores are heavily armed. Food and shelter and water are the three big issues. Water to bathe, not just to drink. Toilet paper is a luxury. The stock market collapsed long ago. Social Insecurity is long since bankrupt. The entire world hates America for repudiating their debts. There are very few Haves and countless Havenots of course. People insist on looking to the government as their savior when the government is broke. 80% of all revenue goes to welfare programs! Hyperinflation has taken over. Permanent martial law is in place. Almost everyone under 70 is chipped. You cannot do anything without your chip reporting it to the government. Nevada seceded and is the only "free" area. It is called the Free State, is Libertarian, and everyone is well armed. However, living is arduous. The world has negative interest rates on all investments, so you have to spend every penny you have. Gold, and even gold jewelry, has been confiscated by the government with prison terms for those who don’t turn it over. Strangely enough she doesn’t explain people who hold SILVER are above the law. You simply cannot confiscate silver, as it is basically an industrial metal, not an investment metal.) It was not confiscated in 1933, and won’t be confiscated in the future. Guns are banned but many people still own one. The Second Amendment was simply cancelled. People are trying to escape from America rather than get into it. Ecoliberalism has taken over completely, and is the national religion. Currency controls are extreme, and you can’t leave the U.S. with any money at all. People who got their money out of the country beforehand are doing well. All the things we’ve been talking about in the Rant for over six years now have come true- plus a lot more. China and Russia are laughing at us in our complete weakness, and wouldn’t waste their expensive nuclear missiles on us. Mexico built a wall to keep the gringos out! 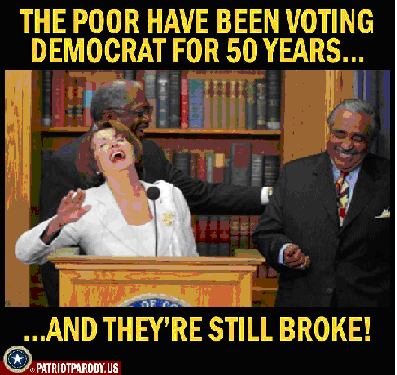 The liberals, of course, are doing worse than everyone else because they are weak and stupid and government dependent. All this takes place in crowded cities however. The people in the countryside are basically doing much better. The farmers are good despite nationalization of all farms. They eat all they wan, and sell what they produce to the government. The government then exports it for income rather than feed Americans. Anyone with silver would be rich but there is almost no talk at all of silver. Rents fell in 10 out of 12 major cities. This is huge folks. This is just one big warning the housing bubble is bursting. We are now a nation of renters. It’s so bad people can’t even afford to rent houses! They are renting apartments instead. You know, like in Socialist Low Standard of Living Europe. Here in Wilmington, tens of thousands of apartments are being built everywhere without stop! It’s a malignant cancer of apartments taking over the entire area. Seriously, how can anyone, say, in San Francisco pay an average of $3,440 a month for a one bedroom apartment? That’s insane. The housing bubble is about to crash! Didn’t you find it strange that Hillary was taken to Chelsea’s apartment when she collapsed at the 9/11 ceremony? Well, that’s because her apartment is a private hospital for Hillary. This way she can deny she goes to the hospital regularly. The Whitman at 21 E. 26th , 4th floor is both listed for Chelsea and Metrocare Services. There is only one apartment per floor. You can look this up yourself. Snopes denies this, which means you can depend it is true. Again, Chelsea's apartment and Metrocare Services are one in the same 4th floor apartment. Hillary's own private hospital. Who are the fattest people in America? Those on welfare. Who are the thinnest people in America? The rich for the most part. The middle class has gone completely to hell unfortunately. How can people on welfare and food stamps be so overwhelmingly obese? No other country on earth makes fat pigs out of welfare bums. 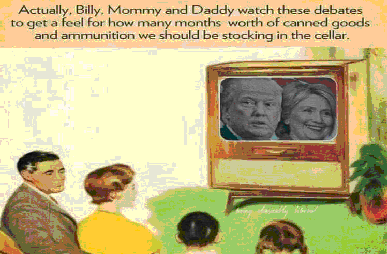 HILLARY SAYS NO CONSITUTIONAL RIGHT TO OWN GUNS!!! Gun sales have skyrocketed in the eight years after Obama was elected. Yet violent crime has gone down considerably. Those are facts and cannot be debated. The problem is about 5% of gun owners hold half the guns! The other 95% hold the other half. Also, only about 40% of households admit to owning any guns at all. This figure is falling badly. However, many people lie to pollsters, as they don't want anyone knowing they have even one gun in the house. They don't trust the government. Hillary says there is no Second Amendment and we have no right whatsoever to own a gun. She calls mandatory confiscation, "voluntary buyback programs". She called the Australian gun confiscation of 1995 a, "very generous voluntary buyback program". She forgot about the prison sentence for not handing them over. If she wins that is the final nail in the coffin for America. Not that Trump is any different or any better. He says one thing and does another. He wants to take guns from anyone on the illegal No Fly List. She keeps calling outright gun confiscation "voluntary buyback programs". Hillary can't appear on close up camera anymore because she has strabismus. This means her eyes look in two different directions at the same time. This is a neurological disorder that affects brain function due to unbalanced visual input. People with strabismus look crazy, as their eyes wander around in different directions. They have more mental disorders than others. She looked completely insane at the debates. September 26 was the first one. She did not go out for the week preceding the first debate so she could rest up. 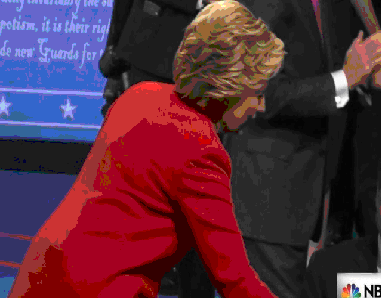 She wore her high tech inductive ear piece at the debate. Her strabismus was very obvious when she constantly looked in two directions at once. The Globe says she is "battling lung cancer". This is very probable. She also may well have various female cancers such as uterine, ovarian or cervical. Chronic, long term coughing is a major sign of lung cancer. We already reported she wear a high tech inductive ear piece so her handlers can feed her the right lines to say. It is well documented she suffers blinding headaches, vision problems, memory problems, horrific blackouts, and a blood clot in her brain. Brain cancer is a high probability here. 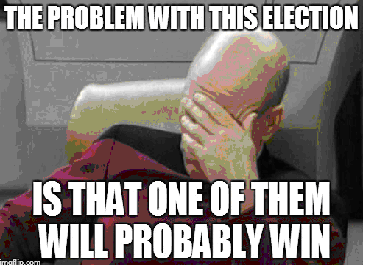 The voting polls giving Hillary a huge edge are all faked. Again, Trump can fill entire auditoriums with overflow crowds. Hillary can't fill a school classroom. Why hasn't she been out campaigning the week of 9/19 to 9/23? Because she's in bed dying, that's why? Trump is making three speeches a day this week as usual. The Democrats know she is dying, and she is now an albatross around their necks. Will the elections be "delayed" (e.g. cancelled)? If voting mattered at all we wouldn't be allowed to vote. The hard working, tax paying, law abiding black citizens of Charlotte (almost 40% black) are not the ones demonstrating violently. 70% of those arrested have out of state drivers licenses. Soros and Black Lives Matter bussed in criminals to demonstrate. The photo below is from a private video of the shooting of Keith Scott in Charlotte. He had traumatic brain damage, was on heavy medication, and refused three times to put his gun down. Here is a photo of the gun taken from a private video. The police showed their official video to the Scott family, and then released it to the public. There was no "book" of course. A black police officer shot him, yet the criminal blacks in Charlotte rioted and looted. They simply want any excuse to riot and loot. This is not the mainstream black community. Charlotte also has a black police chief. You cannot plant a gun complete with fingerprints and blood with a dozen citizens recording you on the cell phones. He refused repeatedly to get out of the car or show his hands, or put his gun down. The black riots go on night after night with the police doing nothing to stop them. The police have given these criminals official permission to keep looting, burning, assaulting and endless mob violence. The majority of good black people are embarrassed by all this. Scott was a violent felon who could not own a gun. He had a restraining order for threatening to kill his wife and her 8 year old child. She got a restraining order against him after he beat both of them with his fists. Why wasn't he in jail? Why weren't we told any of this? He couldn't own or possess a gun. The police were warned he was known to be illegally armed. Three times he refused to put his gun down. IS A HORRIFIC STAGE EVENT GOING TO HAPPEN IN THE NEXT 39 DAYS TO "DELAY" THE ELECTIONS? Hillary is now a liability to the Democrats and the NWO crowd. Her terminal health problems are an embarrassment to them. She may fall flat on her face in public any day. Silver is still $19. Buy all the silver bullion you can and hold it personally. No paper silver, no silver stocks, no unsafe deposit boxes, no storage facilities. Silver is the most undervalued asset on earth. It is at least four times better than gold. The commercials still hold a humongous 97,000 net short silver futures contracts. Is all they can do now is keep the price around $20. Soon they will lose all control. Then they will pile on the long side. They are evil, not stupid. Try and think of ANYTHING on earth to put your money into other than silver bullion you hold personally. Allan Lichtman is a professor at American University in DC. He has developed "13 Keys to the White House" to predict elections. This was based on massive information analyzed by computer programs. He has corrected predicted the last eight elections. He swears Trump will win. 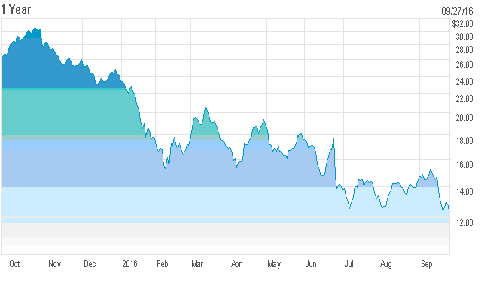 Are you disappointed because silver is stuck in the $19 to $20 area? Well, please take a look at the larger picture. 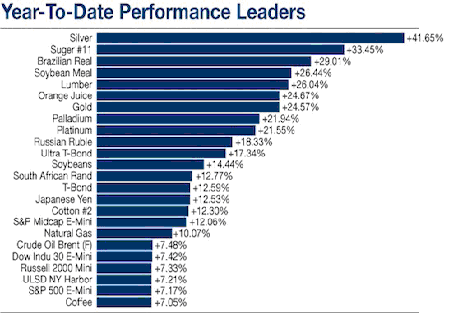 Silver has outperformed every asset on earth y far including gold this year and is up an amazing 42%. Silver is still the most undervalued asset on earth. After posting this chart DB dropped to $10. It may take down all the European banks and then all the banks in the Swift System. They own over $60 trillion in derivatives- which is five times the entire U.S. GNP!!! The derivatives will implode soon. Commerz Bank is also bankrupt. Empty your bank accounts except for a small checking account to pay bills. Dump all your stocks, IRAs, 401ks, and everything else. Put it all into silver bullion you hold yourself. The entire world annual GNP is about 110 trillion. The U.S. alone with 5% of the population is down to about $12 trillion or more than 10% of the whole earth. 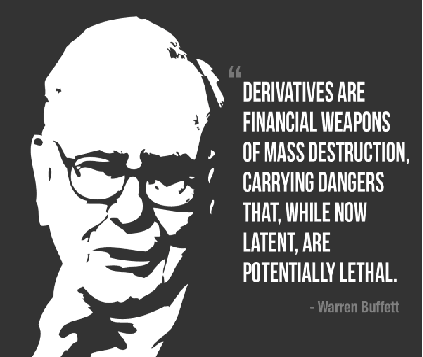 The $700 trillion world derivatives are far far more than $110 trillion though. More than 630% actually. When, not if, these implode the entire worth economy collapses. No country will be spared. Deutsche Bank alone owns over $60 trillion in derivatives. Their failure alone could take down the entire world banking system. They are too big to save, to big to bail, not too big to fail. If voting mattered, we wouldn't be allowed to vote. We have as much freedom as the Cubans or North Koreans. Which Zionist sock puppet do you want? No matter who wins or loses you must continue to buy silver and prep. If you live in a city or crowded suburb you must move- like it or not. You must have food and a water supply. Walk around the house and make a complete list of what you need everyday. Stock up and keep stocking up. 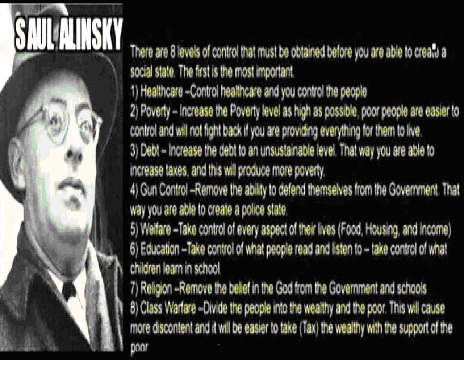 What is happening in Venezuela now will be happening in America. WHAT TO DO ON NOVEMBER 8? We have always preached never vote for the Lesser Evil, because a vote for evil is a vote for evil. There is no choice this time. IF YOU DON'T VOTE, YOU VOTE FOR HILLARY. Jill Steiin is a Jewish communist hiding behind the Green Party platform. Gary Johnson is NOT a Libertarian and BillWeld is a gun hating neocon. Also, a vote for Johnson is a more often than not a vote for Hillary. Many liberals and "independents" (code word for liberals) will vote for Johnson. Trump is just another Zionist sock puppet, but he's less evil than Hillary. ANYTHING BUT HILLARY. That is the standard here. 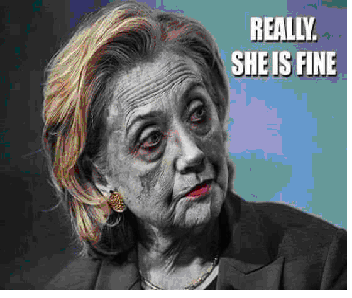 Charles Manson, Donald Duck, Atilla the Hun, Ted Bundy, Howdy Doody, anything but The Hildebeast, the Whore of Babylon. If martial law is declared, Hillary wins, or the election is "delayed" the Rant will shut down permanently. At that point you better be prepared for what's coming.